Texas Freckles: It's just fabric. Right? I'm so close to finishing my quest to collect all the Flea Market Fancy prints. I was daydreaming earlier about what kind of quilt I'll make when my collection is complete. Some very talented quilters have created some gorgeous quilts with this collection. Among my favorites are this one, this one, this one, and this one. Breathtaking aren't they! I can't decide what I want to do with mine yet. I'll probably mix some solids with the prints to make what I have go a little farther. 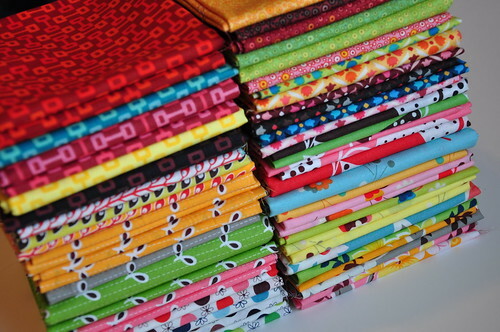 Maybe I could get two quilts out of my stash by adding solids. After matching up a few prints to some Kona solids earlier, I decided to actually cut into some of the fabric as a bit of a primer to making the "real" quilt. Silly isn't it! It's just fabric! Anyway, I used Kona strips left over from the Paintbox quilt and some FMF scraps that I've acquired through swaps. It turned into my first mini quilt! They are little improv wonky stars. Don't faint, but yes, that is actually polyester batting. I'm going to hand quilt this one and hand quilting through Warm 'n Natural (or other mostly cotton batting) is tough. Visually, I like the loft of polyester, so I'm going to try it out for this little wall quilt and see how I like the way it needles. I'll show it to you when I'm finished. Hopefully that will be sometime in the very near future. How funny that you would post about searching for the perfect quilt for Denyse Schmidt fabrics! I've been surfing most of the afternoon trying to figure out what to make with my Hope Valley and Katie Jump Rope fabrics! Those are some beauts you linked to! The wonky stars are cute! I really like Hobbs 80/20 for handquilting...just enough poly to make it easy and give a drape! Thanks so much for mentioning my quilt! And trust me, you will be so happy to have those fabrics out of your stash and out where you can enjoy them everyday! Just don't make the mistake (like I do) of expecting all your guests to walk in and get so excited to see a FMF quilt! But at least you will "know"! 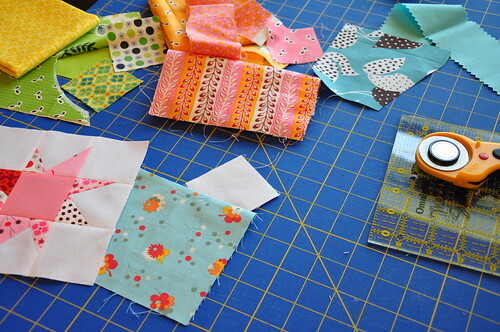 megan's right - these fabrics are so much better in a quilt that you can actually use! (though I certainly know how hard it is to cut into them!) thanks for linking to my FMF quilt too - I actually just took photos of another that I'll be posting next week! Love me a FMF quilt! I can see why you love those quilts like you do. :o) They are precious. I am looking forward to seeing what you decide and how it turns out. :o) I am sure it will be lovely! I like what you have so far! Very cute! That is smart to add the solids. You might want to try using bamboo batting. I used it once for hand quilting and LOVED it. I wish I had a stack of Flea Market Fancy...I have just 4 fat quarters...and won't use them because I'm afraid of not having them anymore! Hoping one day I walk into some out of the way shop and find bolts and bolts of FMF! I am totally agonzing that I don't own one single piece of Flea Market Fancy! You are lucky to have one of each from that collection. I love seeing what you're making with your treasures. Hi there Melanie. Rhonda here from central Texas. I'm a fellow quilter who's just found your blog, liked it and have become a "FOLLOWER!" Hope to visit your blog often. If you get a chance to pop over to mine, I'd love to have you. 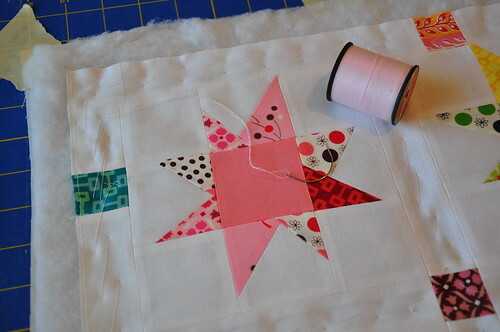 Very very cute little mini quilt. I always love a liberated star and you just can't go wrong with flea market fancy. I have a horde of it and I need to figure out what to make with it. But it has to be perfect. I would hate to sacrifice such beauty for something less than magnificent. On batting...have you tried "Quilters Dream Cotton Batting" I love it. I have been using the request weight and it is so thin and beautiful to hand quilt through. They also make a wool batting the I love for hand quilting, it has a loft similar to polyester. I would love to send you some if you want to give it a try. You can email me your address if you don't think that would be too wierd. I think that fabric is so much fun and whatever you do will look wonderful. I'm also one of the people that you've gotten hooked on hexies. I bought some templates and now I'm scrounging around in my stash. My girlfriend, who is not a quilter, jumped on board too. She's got a leg up on hers and is doing it all in batiks. The darned things are going to be addicting, I just know it! What a special stack. I'm almost glad that I started sewing and quilting when it was too late to start collecting FMF! I just have to enjoy looking at everyone else's. Hope you enjoy cutting and sewing each and every bit!